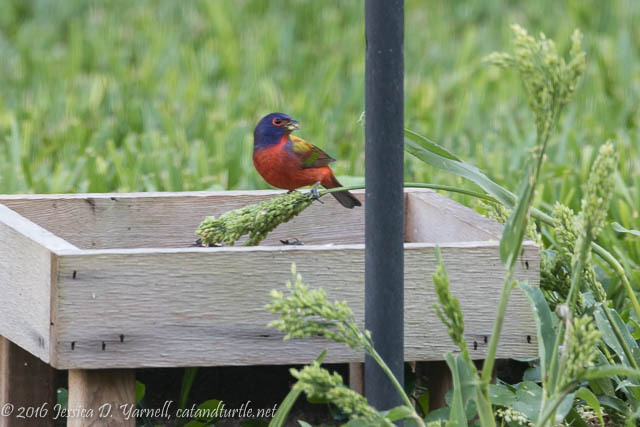 We had an influx of Painted Buntings come in over the weekend as well. 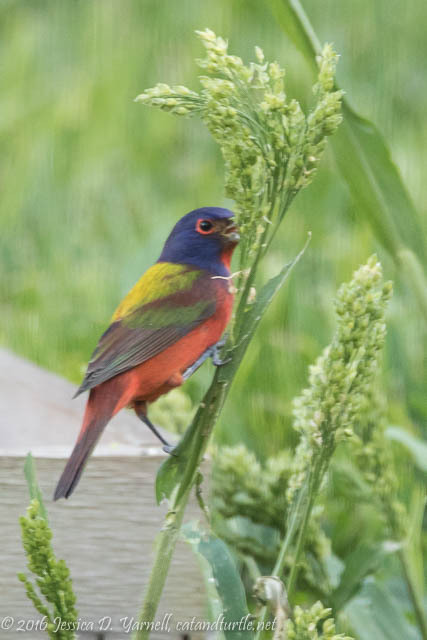 I regularly report my sightings to the Painted Bunting Observer Team, and I’ve had a male and a greenie since the beginning of October. This weekend, I looked out to see three males and two greenies on the feeders – all at the same time! Yep, that made me squeal too. One of the males noticed the millet that has sprouted underneath my feeders. How nice to see him foraging in a more natural setting than my usual cage feeder shots! You’re so lucky to have such fun and photogenic visitors! I love the painted buntings! I’ve only seen one little guy so far this year. I heard the potato chip calls Sunday too. Life is good!